The Idaho Legislature is back in session. This weekly newsletter will provide a quick run-down on some general highlights from the legislature. It will also include a personal message from both of us to let you know how we have been involved in the process as we work to further our District's legislative priorities. On this site, you can view new bills as they are introduced and access both House and Senate daily agendas for legislative committees and floor debates. Please feel free to share your ideas and input on these issues by emailing, calling or visiting me here at the Capitol Building. 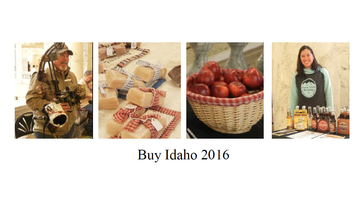 WEDNESDAY, JAN. 20, 2016, 9:54 A.M.
Today's annual "Buy Idaho" show has brought dozens of Idaho businesses to the state Capitol, where they're offering displays, information, free samples and more on the first, second and third floors of the Capitol rotunda. The show is free and open to the public and runs all day. If you are old enough to remember the 1993 movie Groundhog Day, you will know how the first day of the session seemed. That’s right, just like we had done it before and before. But it is a pleasure to be allowed this opportunity, perhaps this time to find a few solutions that we didn’t catch last session. Governor Otter’s State of the State set the tone with no surprises. We are all on the same path as pertaining to a better funded education system. Last year was the first payment. The economic view we have been given appears to be adequate to continue on the five year plan for schools. My budget committee has begun work on the state funding and feel confident we will enable schools to move ahead with the important work they do. Another serious concern for several years has been those in Idaho who cannot afford health insurance and do not qualify for any subsidy. The plan that will be presented will take the cigarette and tobacco taxes and provide $32.00 per citizen per month to be used for the services of our fine health clinics. This should cover preventive care and with some small fees from this group, help keep them more healthy and lesson the use of emergency rooms. The general funds of the state will backfill those items which are not paid for out of cigarette tax with a cost of about twenty million. Interestingly we spend several millions each year to help people stop smoking. Our tax is 57 cents per compared to Utah at 1.90 and Washington State at 3.00. There are many issues yet to be heard, some at this point still unforeseen. As always education funding and the health of our citizens are always right on the top. One very fortunate aspect of this year’s budget is the revenue that was set aside last spring will now pay the bills for the tremendous fires that devastated our state this past summer. We are off and running here at the Idaho Legislature. We spent a great deal of time the first week of the session organizing committees and reviewing rules. The rule-review process is something unique to the Idaho Legislature. We have the authority to review the rules that the Agencies (the Executive Branch) wrote in order to implement the laws that were passed by us (the Legislative Branch) last session. This review process helps to ensure the written rule actually follows the legislative intent of the law. 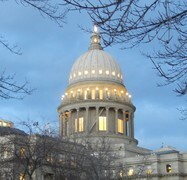 The first few days of the session included the Governors State of the State address, an Idaho Business for Education Event, and a Legislative workshop on civil discourse. We also met with Idaho Consumer Owned Utilities and with Idaho Small Providers (small group homes for the mentally ill). I received the “Ag All Star” award from the Food Producers of Idaho for my voting record on Ag issues last session. 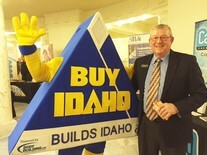 I attended the Idaho Dept. 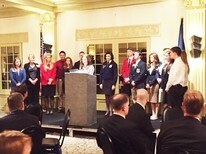 of Agriculture Breakfast Briefing, the Boise Metro Chamber Lunch, the American Legion Reception, and met with the Idaho AFL-CIO. I had the opportunity to learn more about Idaho Professional Technical Education during a presentation with Department of Commerce Director, Megan Ronk. It is an honor to represent you, my constituents, here in the Idaho Legislature. I welcome your input and feedback.